WIN a Boll ALC blade signed by Timo Boll! Thread: WIN a Boll ALC blade signed by Timo Boll! Winner will be announced later today, good luck all! Top 10 Shots of 2018: The Craziest! Hey guys, new 1 set showdown with the current world number 1 Timo Boll! 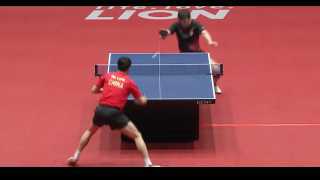 in this video Timo Boll takes on his table tennis idol! Me! Or is it the other way around? During our recent review of the Boll ALC blade with World Number 1 Timo Boll we challenged Timo to a #1SetShowdown. Users had to guess what the score was in a 1 set match up between Dan and Timo to win a Butterfly Boll ALC blade signed by Timo! This one set showdown was probably my most nerve wracking yet! Timo is just so good! Thanks to everyone that entered the signed blade competition. We had a record number of entries and the winner is announced at the bottom of the topic. Enjoy! Thanks to all 3779 entries across TableTennisDaily's website and youtube, Facebook and Instagram channel who entered the competition on what they thought the score would be between Timo and Dan. 381 users guessed the correct score. All 381 users were put into an excel spreadsheet with a number assigned to them. Using the google random number generator the number 24 was produced. Congratulations to David Hessling winning a Butterfly Timo Boll ALC blade signed by Timo Boll! If you can PM your address to TableTennisDaily we will post your prize win right away! Stay tuned for more TableTennisDaily competitions and 1 set showdowns! Thanks. I did not notice this. Congratulations to the winner. But why does Dan create a threat with the video and with this competition, quoted in the same thread (several days later) that the winner will be announced "later this day", but then open a new thread to announce the winner? it´s over guys. well, hope dies last they say. Sorry if you were confused. A new topic is made with the full 1 set showdown so users can discuss the match and what the pro players had to say. Plus the winner is announced in this new topic to. I think you are right though, I need to edit the Original Post of this topic so users don't get confused. Thanks for the suggestion See you around buddy.